Castle Rock Computing is pleased to announce the immediate availability of SNMPc OnLine 12. 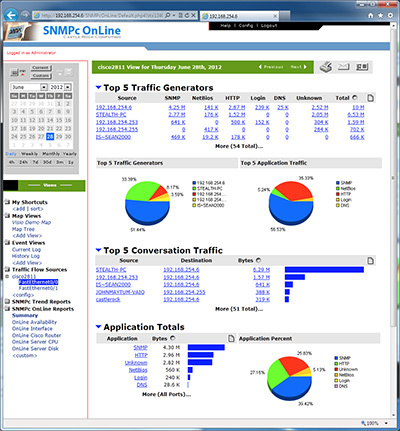 SNMPc OnLine is an add-on module for the companyís SNMPc Network Management System. It delivers a unified web based reporting front end for network statistics, alerts and node information. SNMPc OnLine 12 adds comprehensive support for a broad range of application monitoring technologies including NetFlow (Cisco, Juniper), IPFIX and sFlow (HP, Extreme Networks, Allied Telesyn). For the Network Manager SNMPc OnLine 12 delivers total network visibility of application usage with low cost of ownership by utilizing existing deployed routers and switches. Total Network Visibility — Identify the Top Talkers and Applications on your network. With SNMPc OnLine 12 you can identify traffic patterns and in near real time understand exactly how your network bandwidth is being utilized. Cost Effectiveness — Leverage your existing devices to deliver application monitoring without the expense of deploying additional probes. User Experience — By understanding exactly how and when users access applications you can make informed decisions on allocating network resources and services to deliver a common user experience across distributed networks. Auditing — Monitor network conversations and ensure users are not violating stated business policies. Verify that users are not consuming bandwidth by accessing personal or non-business applications and websites. Security — NetFlow can be used to identify issues such as DDOS, viruses and worms. Track down rogue applications and assess their origin and impact. SNMPc OnLineís ability to store NetFlow data over long periods of time means that network anomalies can be recognized and analyzed. Capacity Planning — By using SNMPc OnLine 12 to monitor application usage over long periods of time you can plan and justify future network growth based on accurate information. Ensure that networks capacity is sufficient as new applications and technologies are implemented. Check the WAN networks are not being overloaded by unwanted or inefficient traffic. Accounting and Billing — NetFlow tracks an individual users application usage and data counts. This detailed information can be used internally for cost allocation and department bill back. Easy Setup — SNMPc OnLine 12 automatically detects and configures itself from received NetFlow data received. This delivers meaningful results with minimal setup and in the quickest time possible. SNMPc OnLine 12 protects companies investment in the Castle Rock Computing management suite by delivering NetFlow monitoring as an integral feature of the SNMPc OnLine module. Unlike many other products in the marketplace SNMPc OnLine is a comprehensive all-in-one NetFlow solution with no additional costs based on the number of NetFlow sources or interfaces monitored. Existing SNMPc OnLine customers with valid maintenance receive SNMPc OnLine 12 including all NetFlow functionality at no additional charge. Also included with SNMPc 8.0 is a free Cisco NetFlow configuration tool which allows users to easily configure via SNMP NetFlow v5 and v9 on their compatible Cisco devices.